My two cents – I had surgery on leg a number of years ago and it started like this. I waited until it hurt really bad and I felt bad. I would get into see the doc and see if they could even give you some anti-bacterial ointment or something. Re meds: remember your digestive process works differently which means meds might be going into your system different. It would hurt to discuss with doc. I also remember be lethargic for a long time post-op. Getting used to running on much fewer calories. Sorry to tell you, but it was 6 months before I felt the Perk back! Just don’t use any over the counter antibacterials like neosporin with out first talking to a doctor, this can cause secondary infections. The wound actually looks pretty good, if there’s no heat, no redness, no oozing of cream or yellow colored exudate and any oozing is clear then you’re in good shape. If you start feeling pain or the redness spreads, or you feel heat or you start getting a fever then go in right away. any type of major surgery, and that’s what this is takes weeks to recover from. I’m not sure you’ll want to change your anti-depressents until you stabilize, but again, I’m not a doc (just a nurse), so if it feels like it’s too much call your doc and talk to him/her about it. When I had my hysterectomy they did it laperscopy. 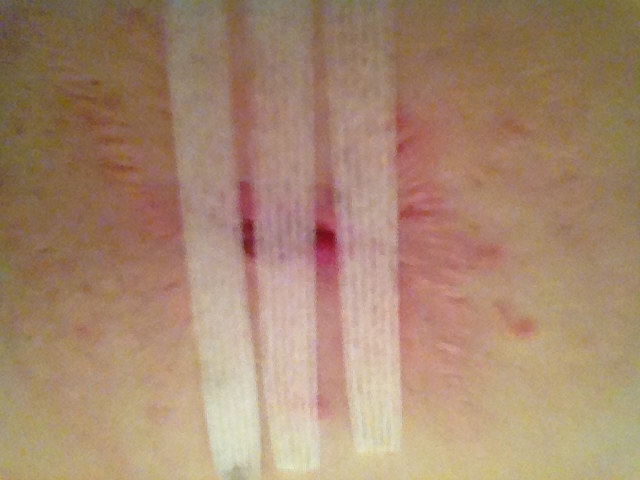 The incision they put the scope in gave me a lot of issues. I had the same thing as you and went to the ER. They had me use sterile water to clean it and gave me some ointment and I had to cover it in sterile gauze. It took a long time to heal. Even today two years later it is purplish. As far as depression. I think any time you have surgery and go under it takes a lot out of you. I remember feeling great but didn’t want to go back to work. I was sort of physically able to go back in a week after my hysterectomy. Mentally I wasn’t ready and my doctor wrote me off for six weeks. I really am thankful. Ooooh, listen to TZ, she knows what she is talking about!!! Sorry that your incisions seem to be giving you trouble. I hope they heal soon and this will all be a distant fuzzy memory. I think TZ is also right about waiting just a bit longer to change meds. Start using the light and make sure you are taking enough time for yourself. Even if it’s just an extra nap during the week, or a few quiet moments to meditate or read or use your light. Definitely keep putting yourself first, no matter how hard it is. Hang in there! You guys are just great. 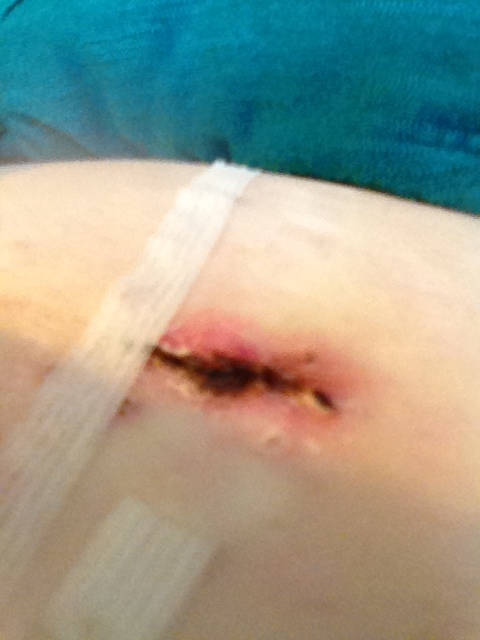 I wanted to let you know that the incision seems to be healing and looking better. Tracey, your advice was great and reassuring. Thanks everyone for caring about me! In my experience these can go either way, so I was nervous. My first c-section I ended up with a bad infection that a section of had to be reopened and cleand up (ooooooo) so I am nervous about stuff like this, but in this case I think we’re on the way to being better. Ohh be careful! 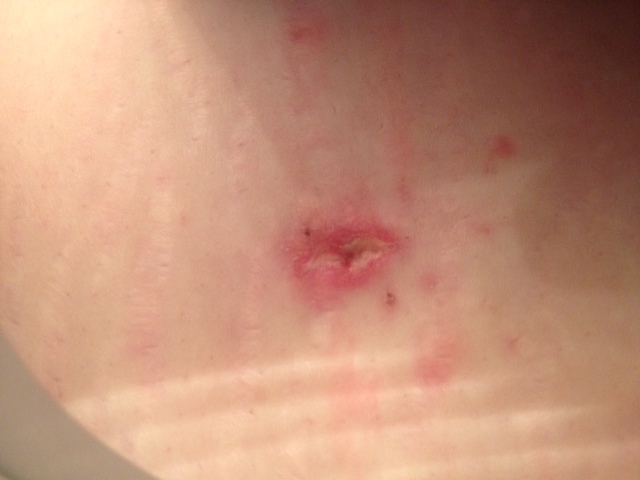 Had wicked infection with my second c-section it began with a little oozing. Nothing to mess with.